Lecithin is an emulsifier used to stabilize recipes that mix polar and non-polar ingredients. That's because lecithin's molecule has both a polar and a non-polar end. Its polar end is hydrophillic (water-loving) and its non-polar is hydrophobic (water-hating). While this property makes lecithin an ideal emulsifier for oil-and-water vinaigrette, lecithin is more often used in molecular cooking to create light, airy foams and mousses. Lecithin is an important natural compound found in egg yolks, but commercial lecithin is soy-based, making it vegetarian- and vegan-friendly. "Lecithin" is a generic term used to describe a wide variety of phospholipids. 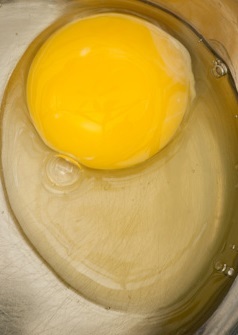 Several types of lecithins naturally occur in egg yolks. These lecithins, combined with lipoproteins naturally found in egg yolks, give egg yolks the ability to thicken and stabilize mayonnaise and sauces. Lecithin also naturally occurs in avocado, hence the reason why you can add lime juice to avocado guacamole without the juice running out. Finally, lecithin is found in soy beans (soya beans in the UK) and most commercial lecithin products (including the food grade lecithin we carry) are made from soy, making them both vegetarian- and vegan- friendly. Since the majority of molecular recipes use soy lecithin, the rest of this page will focus specifically on soy lecithin. The lecithin in egg yolk has long been used to thicken sauces and mayonnaise. Soy lecithin is perhaps best known for its use in chocolate-making. In chocolate, lecithin helps sugar and cocoa particles (water-loving) bind to cocoa butter (water-hating), which makes for a creamier chocolate. In the food industry, soy lecithin is used for a wide variety of applications. Think about it this way: lecithin makes it easier for oil-based ingredients to interact with water-based ingredients. That means that lecithin can be used to emulsify salad dressings, make icings silky smooth, or even improve the texture of shelf-stable baked goods. 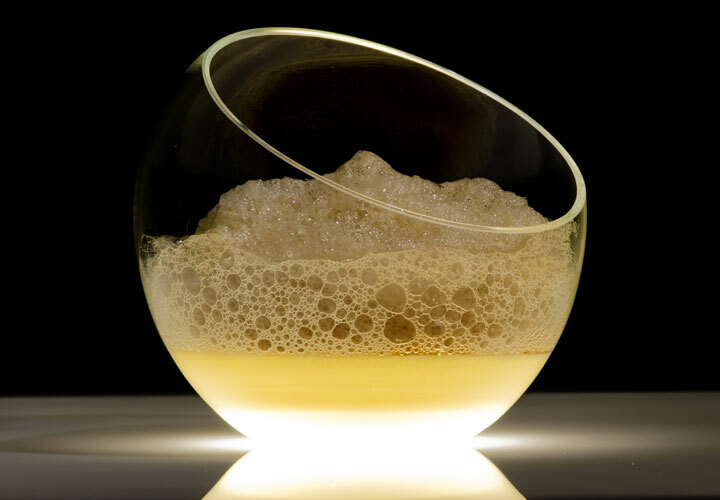 Frozen Parmesan Air is a creation of molecular gastronomy Chef Ferran Adria and his El Bulli team. 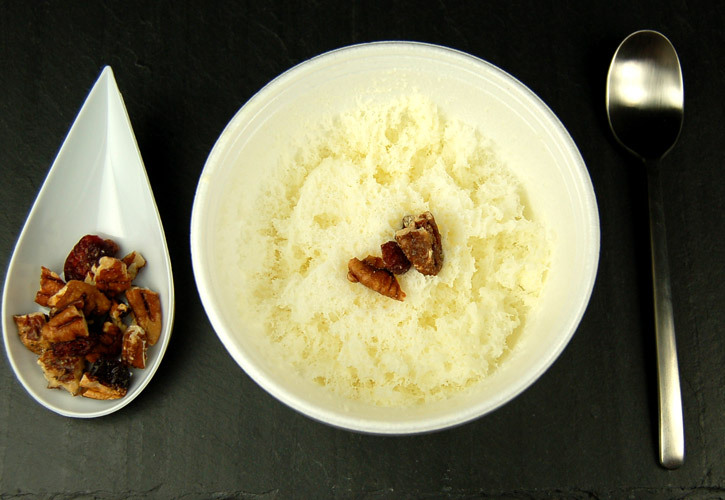 To make it, he combines a 0.52% scaling of soy lecithin with Parmesan cheese that has been melted into water. After blending with an immersion blender, a light foam forms over the liquid and can be used as-is or frozen for a delightful, unexpected treat. A photo is below. For a simple, fun dish that can be made at home, try this Saffron Crème Anglaise with Coffee Air by Chef Alejandro Digilio. The air portion of the recipe calls for nothing more than coffee, sugar, and soy lecithin. The base is a simple Crème Anglaise that provides an interesting contrast of textures. Since lecithin is not technically a hydrocolloid, some of the characteristics we normally discuss in relation to hydrocolloids do not apply. Temperature: Soy lecithin dissolves best in warm or room-temperature liquid, though it should function at any temperature. You may just need more mechanical power (such as blending) to get it to disperse properly. Texture: If a recipe calling for lecithin ends up grainy, you probably haven't applied enough shear force. Try blending for longer or with a higher-power machine. Appearance: Soy lecithin is sold as a powder and as a liquid. Always store it well-sealed and in a dry place, as it will bind to liquid and become clumpy. PH Tolerance: Lecithin functions best at a pH above 4.0. Other Tolerances: Due to its unique molecular shape, lecithin forms protective rings around hydrophillic ingredients. This property is what gives lecithin airs their body and what helps to thicken sauces containing lecithin. The presence of another surfactant or emulsifier can inhibit the function of lecithin, causing lecithin-based recipes to collapse or lose their volume. Of note, olive oil contains naturally-occurring emulsifiers, so excess olive oil can cause poor texture. Simply adding too much lecithin to a recipe can also cause poor texture. To troubleshoot problems, simply try using less lecithin. Synergies with other ingredients: There are no specific synergies identified between soy lecithin and other ingredients. However, a stabilizer or thickener such as xanthan gum will slow the movement of molecules in a sauce, which means that a recipe emulsified with lecithin will stay emulsified for longer. Lecithin will also work in the presence of other emulsifiers, such as Gum Arabic or Pectin. Concentration Range: 0.2-1% for airs and froths. If the recipe does not end up as desired, try using less lecithin. Concentrations in the range of 2% can be used for texture improvement of baked goods. Dispersion: Gently mix into target liquid. Use an immersion blender or other blender to fully disperse. Lecithin is likely to form clumps when first added.